This was the second meal I made out of the pile of veggies I roasted and sautéed earlier this week. I am telling you, I love each meal more than the last one! These sandwiches took only minutes to prepare, but they were so very flavorful and scrumptious, that I am already wishing I could have another one tonight! First, make some more vinegared onions (thinly slice some red onion or shallot, sprinkle vinegar over them, and let them sit for 10 minutes or so to soften). When the onions are ready, take some good crusty bread (I bought a fresh baguette), and slice thickly. Take out 2-3 cloves of the garlic you roasted with the vegetables, and squeeze the mushy garlic out of its skin. Spread this over one side of the bread. Then spread a thick layer of the sautéed greens (mine were chard, green garlic, and beet greens). Finally, top each with a slice of mozzarella cheese and close the sandwich. Place the sandwiches on a baking sheet, and place another baking sheet on top. If your baking sheets are not heavy, you may want to put another pan on top of that, to weigh it down. 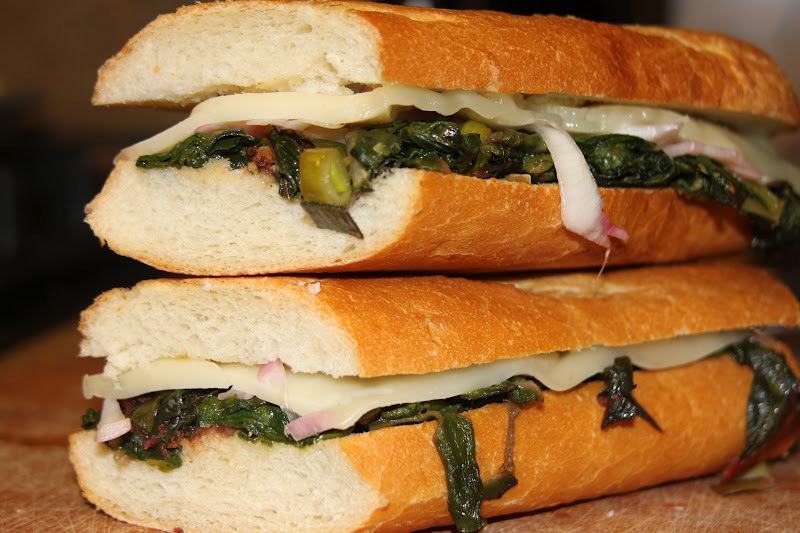 Place the smooched sandwiches in the broiler for just a few minutes... until the sandwich is a bit warm and toasty and the cheese just on the verge of melting. Enjoy one of the tastiest, easiest meals ever!